Today we push on with looking at the new ‘Sweet Wishes’ range of Tim Tams, and turn our attention to the Double Choc Caramel. They have the smooth, thick chocolate coating of the ‘double coat‘ Tim Tam, which is immediately promising. I guess this is where the ‘double’ in the name comes from, as there’s nothing else particularly chocolatey about them. 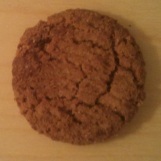 Between the two layers is a caramel-flavoured cream filling, and inlaid in the centre of this filling is a slab of caramel. Caramel that is, in fact, quite chewy. This is really quite good stuff; Arnott’s should really consider using this type of caramel in the oh-so-disappointing ‘Chewy Caramel‘ version. I have to say, they are realy rather good. A huge improvement over the Turkish Delight range we looked at last week. They are very sweet, yes, but the additional chocolate and the chewy caramel really give it a lift, making them quite moreish. They also have a strangely familiar taste to them; something from long ago. Mrs Chillikebab commented on it too, and after much head scratching, we identified what the flavour was. Yes, they are peppery! ‘Peppery?’, I hear you cry? 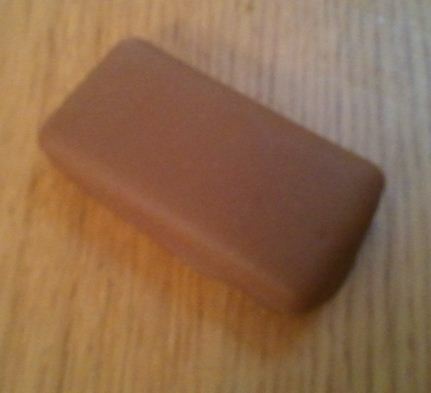 Yes indeed, for they are deeply reminiscent of the flavour of Cadbury’s ‘Finger of Fudge‘. I have no idea if these were ever marketed in Australia, but they were a feature of my childhood in the UK. One of the most notable things about the Finger of Fudge was the TV advert that clearly stated they were ‘full of peppery goodness‘. Everyone I knew thought this was how it went, and indeed it seems the internet is full of people who believe the same thing. Indeed, listening to the advert again, I still remain convinced they are ‘peppery’, as do many others – those suggesting the words are actually ‘full of Cadbury goodness’ are clearly mistaken. That little aside is probably of no interest to my Australian readers, but to me the Double Choc Caramel Tim Tam will be forever ‘peppery’, and jolly nice to boot. I’m going to give them an eight out of ten. Stop the presses! Hold the front page! There is a new range of Tim Tams in town. The ‘Sweet Wishes’ range has arrived, featuring Honeycomb, Caramel and the subject for this post – Turkish Delight. If, like me, you grew up in the UK in the eighties, your memories of Turkish delight will be coloured by this ad; full of mystic eastern eroticism and rubbish visual effects. For years I thought that this rosewater flavoured confection was terribly sophisticated, but now I read on Wikipedia that the rosewater stuff is cheap and tacky and the good stuff has nuts and things in it. How my illusions are shattered. Looking at this pack, though, I can’t help feel that it is the cheap and tacky end of the business Arnott’s are aiming at. Maybe it’s just me, but it all seems rather blowsy with its lurid pink colour scheme and large sparkly writing. It looks like it was designed by a twelve year old girl using the glitter kit she got with Dolly magazine. Quite a contrast to the sophisticated look of the Dark Chocolate Mint pack. Interestingly, the Dark Chocolate Mint pack is still emblazoned with a ‘New!’ corner flash, whilst this new range has nothing on it to suggest it has just been launched. Are Arnott’s super confident about the longevity of this new line? But enough of all of that – what do they taste like? Well, they taste like Turkish delight. Actually they taste really strongly of Turkish delight; the rosewater flavour is quite overwhelming, if rather artificial tasting. I daresay even Edmund Pevensie would have been satisfied with them. They have a thin strip of Turkish delight in the centre of the cream filling (although it is much more chewy than you’d expect Turkish delight to be), and the cream stuff also seems to be flavoured and has a slightly odd pink tinge. The chocolate coating is milk, rather than the dark that Fry’s went for in the eighties. The live up to their billing. They are sweet indeed; quite mind-blowingly so. Your correspondent only managed to eat three in one sitting, so that will tell you something. 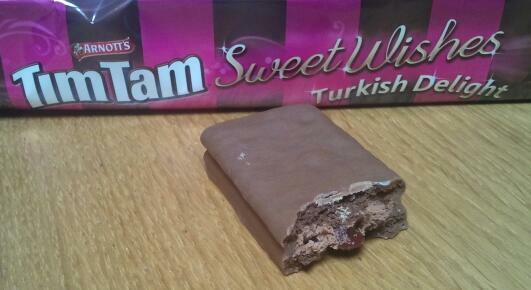 In fact, they deliver exactly what the pack promises; a very over the top, over-sweet, Turkish-delight-and-no-mistake Tim Tam. Some people love them. Girls who love shopping, apparently. Evidently crusty old men who ride bicycles are not in the target market, because I don’t like them much at all. To be honest, I’d say they are on a par with (or perhaps even worse than) the Tim Tam White. So I’m afraid it’s a three out of ten for these. We’ll return to the rest of the Sweet Wishes range in the near future, so let’s hope things will pick up with the other varieties. I’ ve carried a lot of things on my Radish cargo bike over the last year or so – groceries, a table, teacups and even a person. However, there is no doubt that the most precious cargo I carry is my beautiful daughter. 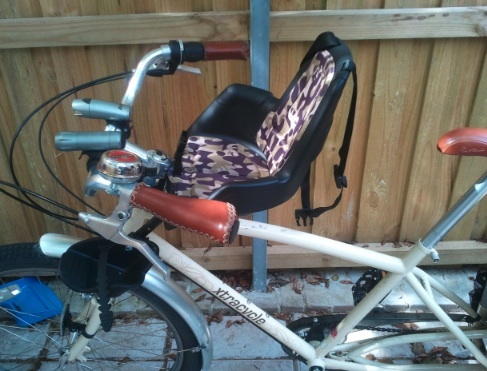 Since buying the BoBike seat, we use the bike quite often to get around; I take her to playgroup, and we go out to the park or to the shops. She really enjoys it, and often talks about ‘going on Daddy’s bike’. And as we go along we sing and chat, and she points out the things we see (‘Doggie!’ “Bus!’ ‘Tree!’), and rings the bell for me when I ask her to. It is lots of fun for both of us, and we laugh together as we whizz down the hill, the wind in our hair. I’m a confident cyclist, capable of holding my own on the road, happy to ‘take the lane’ when needed, very used to traffic and I think quite good at reading road situations and staying out of trouble. Indeed, I’ve escorted novices on their first few commutes, and help them understand how to ride more assertively on the road in order to make the ride safer and more enjoyable. 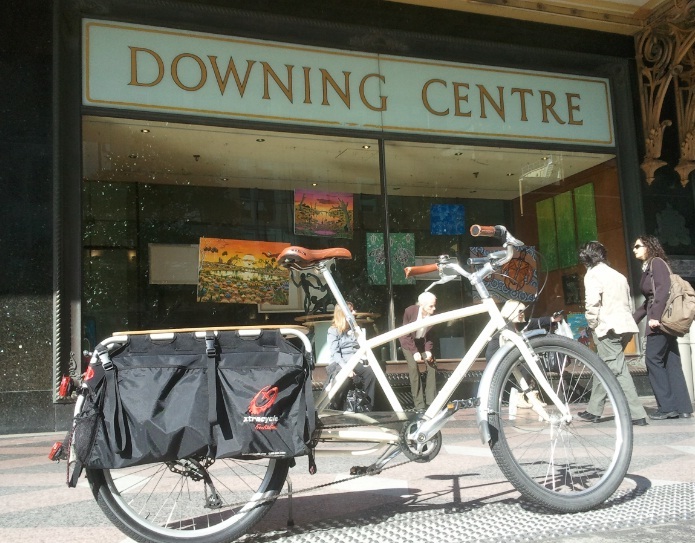 I am also aware that riding a bike – even on the road in Sydney – is not actually that dangerous, despite what many would have you believe, and that your chances of being involved in an accident are actually very very slim – much less, for example, then when walking back from the pub after a few beers, or when playing football. However, from the moment I first set off with Toddler Chillikebab on board, it was clear that I was going to ride differently. A bit slower, yes, after all it’s not going to be much fun for her if she’s bouncing around in her seat. But what was very quickly apparent was that I was going to ride on the pavement for all but the quietest streets. Take this road, for example, which runs near my house. It’s one of those slightly uncomfortable roads for cycling – dual lane, but with lots of parked cars. Riding along you either have the option to take the whole available lane, and risk annoying car driver behind you who wants to go past, or ride next to the parked cars, putting yourself in the door zone and inviting traffic to pass quite close to you in the adjacent lane. I’ve ridden down this road lots of times; it’s not especially fast and the traffic is well behaved on the whole. I certainly don’t think twice about it when I’m on my own; I just take the lane or pull in as seems appropriate and all is well. However, I wasn’t going to ride it with Toddler Chillikebab on board. We cruised along on the pavement instead. It just seemed the natural thing to do. This has really got me pondering how most people think about cycling. Most people who don’t cycle would I’m sure feel the same, even if they didn’t have a toddler on board. Riding on any sort of busy road just isn’t going to happen. I’ve also ridden down Harris Street, and I suppose a few months ago someone had commented on it, I’d have either given them some tips on taking the lane, or perhaps suggested finding an alternative route. But now, I might offer an alternative suggestion – just ride on the pavement. There’s a big, wide pavement on Harris Street, and not many people walking along, so it would be perfect. Of course, you have to ride much more slowly, and there are cross-streets which entail stopping to cross. You also need a different bike; riding on a bumpy pavement on a road bike is very uncomfortable; hard skinny tyres and a hunched-forward position make it very wearing on the wrists. It also feels frustratingly slow. But on an upright bike, with big tyres to soak up the bumps it’s just dandy; you can cruise along and feel quite relaxed. I suspect that that type of cycling isn’t the sort that Omar wants to do, and unfortunately most bicycle advocates, being keen road cyclists, just seem blind to its possibilities. I know that a few years ago I certainly was; it was only when I got the Radish that I started to see another way and I’ve been slowly finding out more about it over recent months. 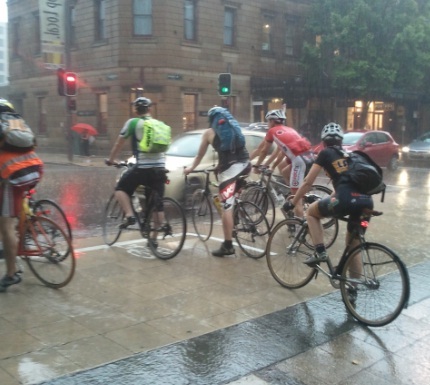 In the Northern Territory it is legal to ride on the pavement, and the NT has the highest modal share of cyclists, despite having the most dangerous roads and the worst weather. Allowing cyclists on the footpaths would probably be a controversial move; no doubt people’s first thoughts would be of lycra-clad hoons carving up old ladies outside the shops. However, I’m not so sure that would happen; road cyclists want to ride on the roads – it’s non-cyclists who would ride on the pavements. They’d probably cruise along slowly just like Toddler Chillikebab and me, ringing their bells and singing songs. Now that doesn’t sound so threatening, does it? Of course, what we’d really like are proper separated bicycle lanes. Without doubt they are the most comfortable way to ride. But while we wait for them to be built (and in Australia it could be a long wait) we could consider allowing cyclists onto the pavement, at least in areas where pedestrian traffic is light. It would probably get a lot more people riding their bikes than telling them that on dangerous streets you should take the lane. 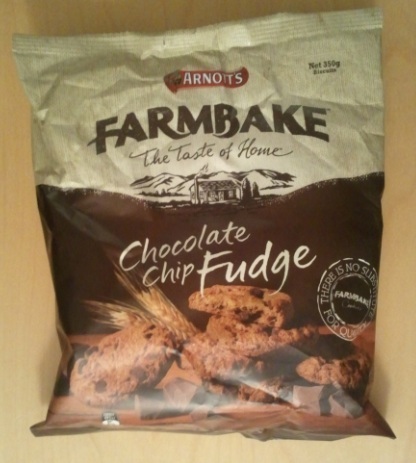 Along with the regular Chocolate Chip Cookie, Arnott’s also bake a ‘fudge’ variety. They are packed in the same sort of bag, and look superficially similar, albeit perhaps slightly darker. Now I have to say I’m not really a great fan of fudge. It’s kind of like toffee that didn’t quite make it. And chocolate fudge is probably my least favourite. But I tried to put that aside as I sampled the these cookies. Unfortunately, my prejudices were confirmed. These biscuits seem less chocolaty than the regular choc chip cookies; somewhat over-sweet and cloying. They also se em to lack chocolate chips; the picture on the pack seems to promise big chunks of chocolate, but these were notable absent from the biscuits in my review pack. So not really a great success; probably best to stick to the original version. I’m going to give these a five out of ten. Yesterday there were some big storms in Sydney; torrential rain lashed the CBD right at peak commuter time. A few years go that kind of weather invariably meant I had the bike paths to myself; a lone nutter braving the rain on my pushie. But yesterday, well, despite the heavy rain there were dozens of cyclists out there. 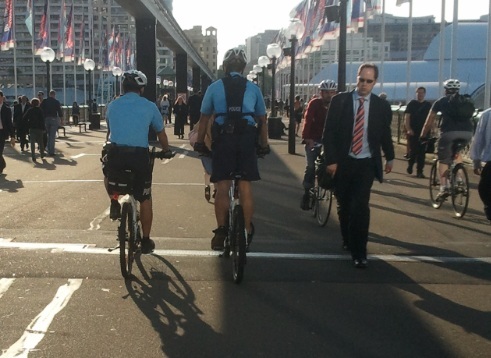 Indeed, I would say there were more cyclists than pedestrians on Pyrmont Bridge; I counted over twenty waiting at the lights to cross over to Union St. So well done Sydney; well done for embracing the bicycle, well done for enjoying the swish of tyres on wet asphalt, and well done for hardening up! What more evidence can there be that a bicycle revolution is underway? I recently finished reading Defoe’s classic ‘Robinson Crusoe’. This is the first book I have ever read in its entirety in e-book form; I read about half on an iPad, and half on my phone. This was in part to see how it felt reading on a screen, and in part just convenience; reading using my phone was something I could do whilst rocking Baby Chillikebab II to sleep. 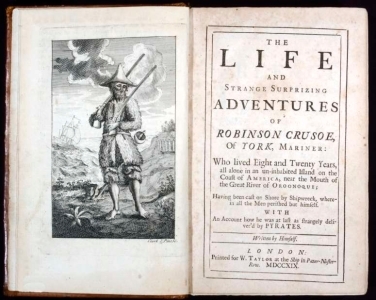 For the first part of the book, I really got quite irritated with the character of Crusoe; he is far from sympathetic. He vacillates between endless hand-wringing about his inadequacies and pompous expositions of his prowess. Still, once you get into the book a bit more it does start to rattle along; it is quite an adventure story that does prompt you to keep turning the (virtual) pages; however irritated I got with it still wanted to see what happened next. Of course, it reflects eighteenth century sensitivities; a time of imperialism, colonialism and slavery. There is undoubted racism in the book; both in the way the native cannibalistic ‘savages’ are portrayed, and also with regards to the Spaniard Popists. However, there are quite significant passages where Crusoe reflects if there is a need for God, the positive character of some Catholics compared to English brigands and even wonders about his right to judge the actions of the ‘savages’, given that their actions come from a wholly alien value set that exists within its own moral framework. It actually comes across as if Defoe could be planting seeds in his readers minds on these issues and asking them to think in a different way, even though in the end conventional order is maintained with the primacy of God and the Englishman re-established. I daresay greater minds than mind have pondered whether Defoe’s intended message is in those heretical passages, or whether they are just there to shock and titillate the reader before a comforting re-assertion of the natural order. I finally got to have my day in court for the four helmet tickets I received earlier in the year. It’s taken a long time to get there – the wheels of justice turn slowly – but on Friday the day arrived. It was a bright, sunny day, so I have a lovely time riding over to the court on the Radish, dressed in my best suit. When I arrived, the police officers who issued the tickets were there, but my expert witnesses were not. One of them would not be arriving until after lunch, and the other was only going to be able to make it if my case was heard between about 1.30pm and 2.30pm. The list of cases to be heard that day was very long, however, and I was number twenty-two, so I was hopeful that it might work out. Initially cases get mentioned in the morning, and at that preliminary mention I asked the presiding magistrate if it were possible to schedule the case for the afternoon, in order that my witnesses could attend. She told me that it was not possible to do this, and the case would be heard when it was called. So I kept my fingers crossed that the long list of other cases would take up the morning. And then it was really just a matter of waiting around. At just after eleven I got a text from one of my witnesses that they were on their way, and would be there in forty-five minutes or so. And at that moment, my case was called. I made my way to the appointed courtroom with trepidation. I was going to have to ask for the hearing to be delayed in order for my witnesses to be there. When I got to the court, it was some time before the magistrate arrived, and he seemed somewhat flustered because he was actually in the middle of another case. However, he just wanted to hear the outline of the matter. The prosecutor outlined the basics of the case, and I confirmed that the facts were not in dispute, but that I would be using the common law defence of ‘necessity’. The magistrate seemed bemused, and wanted more information, so I outlined the very basics of the way the defence would unfold – essentially that the defence allows for infractions to be excused if certain conditions can be met. I was a bit taken aback by this. Wasn’t it his job to know what the law is? He went on, somewhat aggressively. ‘Each of these offences carries a maximum penalty of $2000, and if you pursue this I will be unable to consider any mitigating circumstances. You need to think about changing your plea. You could end up with a very large fine.’ And with that he adjourned for morning tea. I guess any hopes I had for a reasonable trial kind of evaporated at that point. Apparently the magistrate presiding over the case was not familiar with the legal principle I was using, and had made it pretty clear he thought I was wasting his time, with the clear threat of a large fine hanging there. So much for innocent until proven guilty! By the time morning tea was over the first of my witnesses had arrived. This made me feel much more confident; at least I had someone on my side! The indefatigable Sue Abbott also came along to support me. However, getting my other witness to be there was starting to look like a long shot. Indeed, I had only secured his services at the last minute when my original witness was unable to make it, and had never even spoken to him on the phone, let alone met him! The magistrate returned, and continued to deal with the case he has been involved in. I was looking at the clock, and trying to calculate whether there might be a chance to get him there. I took Sue out of the court for a second. Sue agreed, and then the case started. A load of time was wasted at the start with the prosecution and the magistrate discussing whether there was a provision in law to exempt helmet wearing, and if a medical certificate would be acceptable. Perhaps they were looking for a way to get me off, but it had nothing to do with my defence. There are no such exemptions allowed; I know because I have checked. Interestingly though, the prosecution alleged that the police would not issue a ticket to riders who were able to produce a doctors note saying they were unable to wear a helmet. This certainly isn’t what the law says, so if the police would actually do this I don’t know; at best it would be an unofficial policy. Then I outlined to the magistrate the basis of my case, and he interrupted several times. He had clearly been off to read up about the defence of necessity as he had his book open in front of him. I got very close to retorting that if he shut up for a moment and let me speak then he might find out how it would all fit together, but I refrained. I did say that I would indeed be able to show that, and had expert witnesses there to support the point. And then I suggested that I give my evidence. So I did, although it was hard to get all my points across because the magistrate kept interrupting me. Eventually I got most of it out, and then I faced questions from the prosecution, including a whole load of bizarre questions about whether I could fit my bike with a device that make a light come on when I went over a certain speed(!). Eventually even the magistrate asked him if these questions were relevant, to which he limply said, ‘no, not really’. Then it was time to call my first witness. ‘I call Doctor Veronica Harris!”, I said grandly. I have no idea if that is what you are supposed to say, but that’s what they do on TV so I went with it. Dr Harris took the stand, and I got to ask her my questions. She was superb; calm, authoritative and eloquent. It was at that moment that the atmosphere in the court began to change. I sensed the magistrate sit up a bit more, and take some notice. This wasn’t just some guy trying to talk his way out of a helmet fine; as she spoke it I think dawned on the magistrate that my outline of how the defence of necessity applied to the case wasn’t just puffery. Here was an acknowledged expert in her field clearly articulating one of the key points of my defence. Veronica dealt with some rather trivial questions from the prosecutor (who by now seemed to be well out of his depth), and left the stand. I glanced at the clock. Not even one o’clock. So no chance my other witness was going to be there. I was going to have to try and prove another key point with the help of just a few newspaper cuttings; something that I suddenly realised was going to be impossible. I caught Sue’s eye, and she grinned, giving me a thumbs up. Could it be? Was he here? The door of the courtroom opened, and in walked the Professor. I only knew what he looked like from his little picture on the University of Sydney web site, but as he walked in it was like a huge choir suddenly started singing the hallelujah chorus. I was gripped by a sudden excitement. He was here! I might actually be able to pull this off! I managed to shake Chris’s hand as he walked past and onto the witness stand, and then I asked him my questions. It probably ranks as the strangest introduction I have ever made; the first words I spoke to the man was to ask him questions in a court of law. He too was superb. He outlined his impeccable credentials, including the significant research he has undertaken in the field of health, bicycle use and helmets, and all of a sudden I again felt the magistrate paying even closer attention. The other key point of my defence was clearly supported. The prosecutor, by now looking rather flustered, asked a few questions that Chris swatted away, and then it was time for the summing up. The magistrate then said he needed to consider the matter, and called a lunch recess for an hour. I was pretty keyed up, and whilst I forced down a sandwich the rational part of me knew that I was not going to win. No magistrate is going to risk setting a precedent like this one. However, a part of me was just wondering. Maybe? Maybe? Clearly we had given the magistrate a lot to think about; compared to the last time when the magistrate pretty much told me I was speaking nonsense from the instant I finished. I was not the only one thinking there was a chance. We went back to the court and whilst we were waiting for the magistrate I asked the prosecutor for his opinion. He was looking worried. “It could set a very dangerous precedent,’ he said. Then the magistrate came back in and delivered his verdict. He spoke at length, and clearly had spent some time preparing what he was going to say. He reviewed all the evidence presented, and basically accepted all of it as factually correct; he also made some comments about the bicycle helmet law not being ‘helpful’. He had also finally grasped how it was that my case fitted together, as he clearly laid out how my defence worked, with the various interlocking aspects. However, he did not accept that the conditions needed to fulfil the defence of necessity had been met; specifically he felt there was not enough ‘urgency and compulsion’. There was no axe-wielding maniac. And so I was found guilty. I walked away with a token $50 fine, and a kind of warning that the next time I came to court the fine would be larger. However, I think the case was a success. I was clearly able to demonstrate that this was not just a trivial matter; I forced the magistrate to take me seriously and he had to spend an hour thinking about it, and perhaps struggling a bit to find a hole in my arguments he could use to dismiss the case. It also highlighted the absurdity of the bicycle helmet law to the point where he was prepared to criticise it on the record.